Apex City Of London Hotel. Further to your resume submission on the www.postjobpostresume.com website,we wish to invite you to submit your resume/CV as soon as possible for the above stated position in our hotel. Receptionist required in our Hotel located in London. Ideal candidate must be bright, enthusiastic and works well in a team as well as on their own.The candidate must have good written, verbal and numerical skills must be strong. Control of sales and deposits ledgers, liaising with the accounts department. To check guests in and out of the hotel to the required standard. To maintain guest contact in the front hall and ensure guests` needs are catered for. Recording of all postage expenditure on a daily basis. Responsible for stationary budget and control. To undertake any duties, within reason, that aid the smooth running of the hotel. Benefits include monthly bonus scheme, uniform, pension scheme,leisure club membership, Free meals on duty,straight shifts only 7.30 am to 3.30pm, 3 pm to 11 pm, or 9 am to 6 pm. Please send us a confirmation if you have received this message. Thank you for your interest in Apex City Of London Hotel. This e-mail (including any attachments) is intended only for the recipient(s) named above. It may contain confidential or privileged information and should not be read, copied or otherwise used by any other person. expressed in this message is that of the author and does not necessarily reflect those of Apex City Of London Hotel. This company does not take any responsibility for the views of the author in any matter not related to the company's object. I am delighted to inform you that based on our qualifications and personality assessment,you have been selected as the most suitable candidate that applied for the position of Receptionist in our company amongst several applicants.In view of this,you have been offered a job in the prestigious Apex City Of London Hotel, 1, Seething Lane, London, EC3N 4AX as the Receptionist.You shall assume the responsibilities as described in the contract/agreement.We do sincerely hope you will stand up to this new challenge. We want to recruit the best people and retain them,so you'll enjoy a competitive salary and benefits package.This will include your meals when on duty,a smart and stylish uniform,free dry cleaning and available live in. As you join us to become our Receptionist,you'll need the confidence,knowledge and skills to excel.You will benefit from training from day one,as we run our own training programme which is updated annually to reflect the requirements of both our business and our people.You will start by attending a two-day induction which all new full-time employees undertake (orientation session).This is held a day after reporting for duty,so you get to know about us by experiencing for yourself the service we offer. We also have a regular review system,which gives you the chance to talk about your job,your training and your future. If you want to get to experience working in other of Apex hotels across the United Kingdom,and develop your career in the process,then we offer excellent transfer opportunities within the Apex Hotels group. We will at any time welcome input from you as we believe in trying new ideas and challenging the norm. A sample electronic copy of your agreement/contract is attached in this mail for your review and endorsement after which it shall be authenticated by our attorney. We have sent out an application for approval of employment to the immigration consultancy agency (Definitive Work PermitLtd,Grosvenor Gardens House 35/ 37 Grosvenor Gardens London SW1W 0BS) as a requisite for your work permit and have also filled various work permit application forms as requested by the agency.You shall be contacted within a short period either by phone or by email by the agency to inform you of the necessary requirements for the work permit. However,I wish to remind you that you shall be responsible for your work permit processing including any applicable fees as we have already written an application for the approval.We were informed that the work permit shall be issued to you specifically and only for the position of Receptionist with Apex City of London Hotel, 1, Seething Lane, London, EC3N 4AX. However,If you have reasons to believe that you may not be available by the required resumption date stated in the contract,please kindly indicate so and state your reasons clearly.Endeavor to provide us with your current postal address where we shall be sending your flight ticket to as soon as possible.If you have any enquiries,feel free to contact me. Thank you for your continued interest in Apex City Of London Hotel. This e-mail(including any attachments) is intended only for the recipient(s) named above. It may contain confidential or privileged information and should not be read, copied or otherwise used by any other person. Any statement and/or opinion not related to this company's business and expressed in this message is that of the author and does not necessarily reflect those of Apex City Of LondonHotel.This company does not take any responsibility for the views of the author in any matter not related to the company's object. We received an application from your prospective employers requesting for our services to procure an approval of employment letter and a United Kingdom work permit from the Home Office on behalf of Miss Young .According to your employers(Apex City of London Hotel),You have been offered an employment with their company as a Receptionist. The various work permit forms have already been completed by your employers and returned to us for onward processing.According to your employers,your employment status with them is permanent and so the work permit for which this application is made will be valid for 60 months within the duration of your employment with your employers and you will be required to apply for an extension of the work permit after this period. Our service includes the processing of the application for an approval of employment,the processing of the application for your work permit,collation of all necessary documentation,maintaining liaison with you directly and the United Kingdom Home office and also with your prospective employer,submitting the various applications to the Home Office and maintaining follow-up progress checks on these applications. However,applications for Business and Commercial work permits are subject to a charge by the Home Office.The fee is �190. This applies to all work permit applications including extensions and change of employment applications considered under the Business and Commercial, Training and Work Experience, Sports and Entertainment, Sectors Based Scheme (SBS), Student Internships, Sponsored Researchers, Postgraduate Doctors & Dentists and GATS.The fee charged is for the consideration of the application and not for the issue of a decision. In order for the UK Home office (Border and Immigration Agency) to be able to consider the application the valid fee, it must accompany the application form. Failure to submit a valid fee will mean that the case cannot be considered. We charge an additional fee of �200 for our services for each consideration of a work permit application (inclusive of VAT) and a fee charge of �25 for delivery. ii.detailed references from past employers verifying a minimum of two years relevant graduate level work experience. Sender's name; . . . . . . . . . . .
Sender's address; . . . . . . . . . .
MTCN; . . . . . . . . . . . . . . . . . 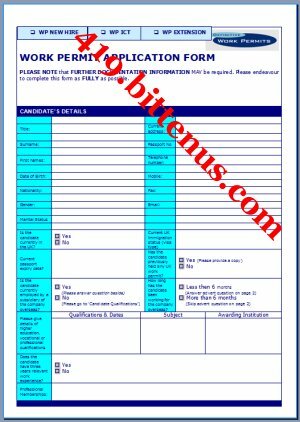 Send us the requirements(including the attached application form) as soon as possible.Fill pages 1-3 of the Visa form or you fill completely our company assessment form.Endeavour to send a copy of the payment details(scanned copy of payment slip) to us as soon as the payment has been made and also note that you are required to expedite action in this regard. Send all the necessary requirements through return email,scanned. I look forward to hearing from you; in the meantime please contact me by email or phone should you have any queries. error, please advise us immediately and delete the e-mail. 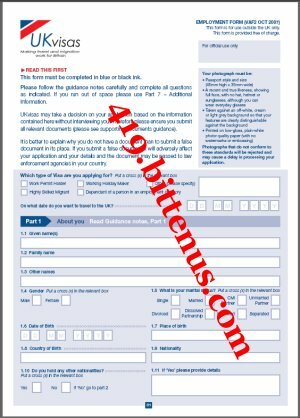 Definitive Work Permit Ltd has taken every reasonable precaution to ensure that any attachment to this email has been swept for viruses. However, Definitive Work Permit cannot accept liability for any damage sustained as a result of software viruses and would advise that you carry out your own virus checks before opening any attachment.